The Batman Who Laughs #2 review – AiPT! Batman finally comes face-to-face with The Batman Who Laughs and The Grim Knight! Batman’s origin story has been told a thousand times across countless movies, television shows, and comic books. Perhaps no other character in comic book history has an origin story that’s as strongly tied to their DNA. He’s the only character whose beginnings I expect to be directly referenced by each and every author that takes up the mantle — it unquestionably comes hand-in-hand with writing the character. I feel there’s an unspoken rule when penning the Dark Knight in that every writer who wants a shot at him needs to first become intimately familiar with his origin story, and how it drives his choices throughout his years of crime fighting. With this series that rule is taken two steps further with the presence of two more Batmen than we’re used to: The Batman Who Laughs and The Grim Knight. Luckily for us, Scott Snyder created both characters and has been writing Batman stories for nearly eight years, with little pause between runs. There’s no one better to have behind the wheel for the coming confrontation between Bruce and the two worst versions of himself that the Multiverse could spawn. Thus with the initial setup issue behind us, it feels fitting that this one begins with a first person narration of Bruce’s recollection of the night that his world changed forever: the night his parents died. This life-defining tragedy is shared by The Batman Who Laughs and is even more intrinsically tied to The Grim Knight’s incarnation of Batman than even that of our own. Right out of the gate we have this foreshadowing and looming presence of The Grim Knight, but thanks to Snyder we completely forget about that once The Batman Who Laughs appears. When The Grim Knight finally does show, it’s a shock for Bruce because with The Grim Knight comes a single solitary bullet and the physical manifestation of the deepest held fears Bruce holds about himself. I absolutely loved the parallels between this confrontation and the life-defining moment of Bruce Wayne’s childhood — both being at the end of a single bullet. What makes Bruce’s life so tragic is his inability to have any sense of normalcy and happiness, because he refuses to let himself experience what most of us probably take for granted: having friends, going to the movies, joining a club, having a family, and the most basic of hobbies. The mission always comes first, and because of that he’s destined for a life that’s awash in hardship. Snyder recognizes the deep sadness that is Bruce’s life and it’s through The Batman Who Laughs that we’re reminded of everything that Batman isn’t when he’s not saving the day. Bruce Wayne isn’t a happy person. He’s not out having fun when the JLA alarms are quiet. He isn’t like Superman, who’s at home with his wife and son. He isn’t using his near limitless funds to pursue a fun passion, or anything else that a “normal” person would do. He’s living and breathing his mission to protect the innocent and fight crime. I’m a history buff, and after reading Scott Snyder’s Batman runs over the years, I’d be shocked if he wasn’t too. From Court of Owls and the Talons, to Gates of Gotham and the founding fathers of Gotham, to today with The Batman Who Laughs, we’re shown more and more parts of Gotham that we never knew existed. So while Snyder has amply built upon the Batman mythos, he’s also created a far more interesting and mysterious Gotham during his time with her. I love the depth of the mythology the city now possesses. Speaking of history, Snyder and series artist Jock will be unearthing some of theirs from way back in 2011, and some of you may just remember it: Batman: The Black Mirror. I’m not one for spoilers, so let me just say that an important character from Black Mirror has returned and may be Gotham’s only hope for surviving The Batman Who Laughs. Anyone who has read Black Mirror is going to be very excited to see who has returned. Jock previously won my heart with his work in Wytches, but he may have outdone himself with The Batman Who Laughs. This is perhaps the best minimalist work I’ve ever encountered in a Batman book, and after reading quite a few Batman stories over the last twenty plus years, that’s saying something. Prior to Jock’s work on this series I had always looked to Tim Sale’s The Long Halloween and Frank Miller’s The Dark Knight Returns for the best minimalist work on Batman, but now I can happily say I look to Jock’s The Batman Who Laughs. Just look at the page I shared above — Batman appears four different times and besides the trademark sharp white eyes, all we catch a glimpse of is the top of his cowl in just a few simple lines. And yet this doesn’t detract in the slightest from Batman’s presence; while sheathed in near complete darkness, he’s still commanding, still frightening and he’s so strongly what you expect to see when you think of Batman. I’ve said it before and I’ll say it again, Jock’s ability to use negative space to its fullest extent is a match made in heaven when combined with a character that encapsulates darkness and the color black. Perhaps my favorite parts of Jock’s work here are the faces of Batman and The Batman Who Laughs from the moments leading up to and during their confrontation. 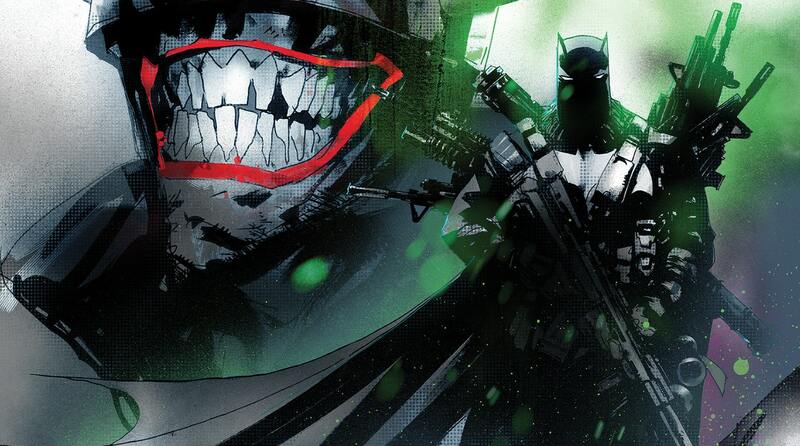 The Batman Who Laughs’ smile is drawn so damn eerily, and whether he’s cutting down guards or punching Batman, it’s plastered on his face. When we finally get up close and personal to him, we see jagged, feral looking teeth filling a black mouth with thin, blood-flecked lips, which leaves you feeling just plain unsettled. Throughout the struggle we see Jock use Batman’s eyes and mouth to tell the story of his emotions and it’s done so expressively that you really don’t need the dialogue to follow the progress of the encounter. The Batman Who Laughs isn’t The Joker — he’s Batman. But he is what he is because he killed The Joker and absorbed super-toxins that were released once Joker’s heart stopped beating. At the end of the first issue in this series we witness the same thing happen to this world’s Batman, but in this case it’s because The Joker shot himself in the chest. Regardless, the toxins are in Batman’s system, and it’s only through extremely desperate measures that he’s able to stave off the full transformation and stop himself from becoming the second Batman Who Laughs. But the counter measures are only temporary, with Batman having a week at best before he loses himself to the toxins and we can already see them beginning to take effect. What I find most compelling about Batman’s slow transformation into a monster is that we get to watch him begin to view the world through the Joker’s eyes, and unlike The Batman Who Laughs’ transformation, The Joker isn’t dead; he’s alive, and kinda-sorta allied with Batman. I cannot wait to see how The Joker and Batman will work together as Batman slowly becomes more and more like his lifelong nemesis. This minute-by-minute test of will for Bruce, combined with having to combat the two deadliest foes Batman has ever faced, delivers a comic book that’s utterly fantastic from start to finish. The Batman Who Laughs is quickly pushing its way into a place of honor within the annuals of Batman comic book history. The minute-by-minute test of will for Bruce, combined with having to combat the two deadliest foes Batman has ever faced, delivers a comic book that's utterly fantastic from start to finish. The confrontation between Batman, The Batman Who Laughs, and The Grim Knight doesn't disappoint. Bruce comes face to face with the greatest fears he holds about himself. Snyder continues to build upon his work of enriching Gotham's mythology. A character out of Snyder and Jock's past work on Batman returns.